Ichneumonidae (Ichneumon wasps) is one of the largest insect families, with over 4,000 species throughout North America. They are slender-bodied wasps with long antennae and vary considerably in form, size, and coloration. In some species there are considerable differences in size and coloration between sexes. Many species have a sickle-shaped abdomen. The ovipositor can be external or hidden within the abdomen and as long or many times longer than the body. Ichneumon wasps attack larvae or pupae of flies, caterpillars, beetles and sawflies. Eggs are usually placed inside the host larvae and develop internally, though a few are ectoparasitoids, feeding on the outside of the host. Members of the Ichneumonidae look similar to the Braconidae but are generally larger. The main distinguishing feature is the venation on the forewing. 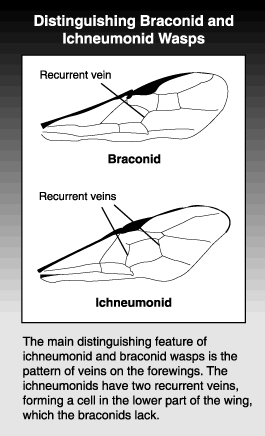 The ichneumonids have two recurrent veins forming a cell in the lower part of the wing which is lacking in the braconids. Ichneumonid wasps have been reported from several fruit pests, but none are specifically discussed here because there is not sufficient information to recommend how they might be managed and what their impact on the pest is likely to be. As mating disruption and soft insecticide programs gain wider acceptance, the occurrence and impact of ichneumonid wasps on certain pests will likely increase.